Rs.100 for Practical only in any SBI branch (or) online Payment. To make online payment through the link given below use your Application number as Registration number. Application form has to be filled up online & the printout duly signed by the candidate and Head Of Department with Stamp. Candidate has to submit the application form along with fees challan(Depositor Copy) to GTU on or before 26 March 2018. An applicant must submit their application in GTU personally or send to GTU via Post to: "The Registrar, Gujarat Technological University Nr.Vishwakarma Government Engineering College Nr.Visat Three Roads, Visat - Gandhinagar Highway Chandkheda, Ahmedabad – 382424 - Gujarat”. Application received after Last Date of Submission will be Rejected. Please write "CCC Exam Form" on top of the Envelop. Before printing the registration form, Please verify that Barcode and Photo is properly displayed or not. 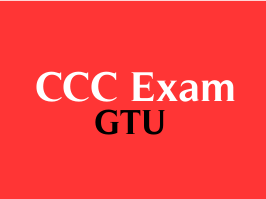 All Rights for GTU CCC Exam Registrations are Reserved by GTU.